RedStamp, Velvet Raptor, and Kiddywampus are joining forces with the Junior League of Minneapolis tonight to offer a holiday shopping experience that will not only allow you to cross some recipients off your list and save money while doing so, but also support two worthy Junior League projects. So here’s how it works: Buy a Save + Share card for $40. Show your card at checkout and receive 20 percent off your purchases at the participating stores until November 7th. Kiddywampus will have its usual assortment of wonderful toys, art, baby items, and books for sale. 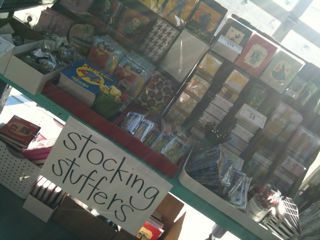 And tonight, RedStamp desk accessories will be 20 to 50 percent off, plus 20 percent if you have the Save + Share card! One hundred percent of the proceeds will go toward the Junior League, including its two new projects, Between the Lines and Backpack Buddies, which benefit Minneapolis children and their families. Doing good while shopping local and crossing holiday to-dos off the list? Now that’s multitasking.